We’d love your help. Let us know what’s wrong with this preview of TimeRiders by Alex Scarrow. But Liam, Maddy and Sal aren’t rescued. They are recruited by an agency that no one knows exists, with only one purpose—to fix broken history. Because Liam O’Connor should have died at sea in 1912. To ask other readers questions about TimeRiders, please sign up. It is in our nature to destroy what we create. (Dr. Paul Kramer) in what page is this quote on? I picked this book up at Books-a-Million, a bookstore I don't usually shop at. I had looked at it several times at other book stores, but I had never bought it until that night. I have since learned that if I look at a book several times, but only buy it later, I will probably love it, and this is no exception. TimeRiders is a time travel story about three kids saved from death to protect the future from time travelers who mess with time. There is more to the story, though, because the kids start I picked this book up at Books-a-Million, a bookstore I don't usually shop at. I had looked at it several times at other book stores, but I had never bought it until that night. I have since learned that if I look at a book several times, but only buy it later, I will probably love it, and this is no exception. TimeRiders is a time travel story about three kids saved from death to protect the future from time travelers who mess with time. There is more to the story, though, because the kids start to doubt that what they're being told is the truth. There is a bigger mystery behind this series than how to fix time. It's a very good book, the first in a nine-book series, and I would recommend it to science fiction and mystery fans. Liam, Sal and Mandy are a team of time travelers sucked into a adventure that will change the course of world history. A fun read. Loved ‘Captain Bob’!
" Liam O’Connor should have died at sea in 1912. Yet moments before death, someone mysteriously appeared and said, ‘Take my hand ...’ "
These three teens are saved from certain death and catapulted into a world of time travel and mystery. 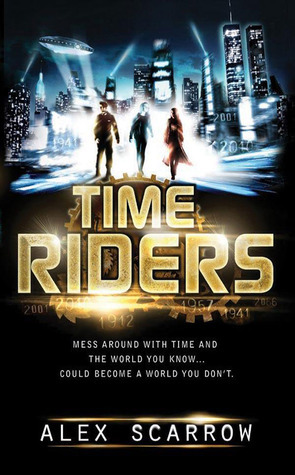 They become The TimeRiders is a great book that has hooked me for the rest of the series. The blurb for this book is brilliant. How can you not be intrigued by this? I really enjoyed the story, I think that Scarrow has done a great job. This is an action-packed adventure that has plenty of intrigue and imagination. The plot is set across multiple time frames and works really well. I'm very keen to move onto the next book in the series .... and beyond. (I understand that the 7th book has just been released - I'd better get cracking so I can catch up). For any of my usual Middle Grade followers, here's a tip. The target audience for this book is YA and there is violence in some parts, so I wouldn't recommend it for Middle Graders. Note: I don't claim to be a pro-reviewer, I am a reader. My reviews are based on my personal thoughts around the story that the book is trying to tell. I'd rather focus on the story (which is the reason I read) rather than dissect the book and pass comment on writing style, structure or typos. If books won accolades for the gripping start of their plots then this first volume in the series ought to have won award after award after award. It is a really clever concept where young people destined for a horrible death are rescued by a stranger suddenly appearing in the moment of catastrophe. The option given to them, either stay and die as was planned or take the step into the unknown and become a 'Time rider'. The job of these new recruits is to live in one day of time continually repeat If books won accolades for the gripping start of their plots then this first volume in the series ought to have won award after award after award. It is a really clever concept where young people destined for a horrible death are rescued by a stranger suddenly appearing in the moment of catastrophe. The option given to them, either stay and die as was planned or take the step into the unknown and become a 'Time rider'. The job of these new recruits is to live in one day of time continually repeated but watch for any slight change in the repeated action, changes that would signify someone had entered into history at a different point and had skewed history. The flaw in the plotline was the fact that the timeriders themselves were aberrations in history. They ought to have died and therefore their presence in the 24 hour time capsule they inhabited was a sensitive balancing act. They needed to pass through each day without affecting or changing the throb of history other than the moment when they encounter glimpses of new details in an otherwise identical day. This first novel in the series introduces the main characters and their first adventure which is to go back into time and prevent Hitler being advised against invading Russia. The plot and initial concept is excellent, the sadness I felt about this was it missed an opportunity to investigate in a quite ingenious and challenging way the alterations in history that might have happened. Scarrow chose instead to veer wildly into apocalyptic destruction and zombie terror instead of writing a more thought provoking and intriguing story. Once again of course, this is a book for young adults and not picky hyper critical middle aged blokes so I would hate to denigrate the novel in anyway that would stop its target audience from picking it up. It is clever and exciting and I will definitely read another. The relationship between the lad Liam and the artificial intelligence Bob is a delight and really works, what doesn't work is Scarrow's attempt to differentiate the young people by their idiosyncratic way of speaking. Liam's irish brogue, Sal's Indian street speak just clunk and grate. I really hope Mr Scarrow in the next book just makes use of 'Sal said', 'Maddy suggested', 'Liam shouted' etc. 4. Ale len preto, že viem, že táto séria bude mať 9 častí a na GR je len 5 hviezdičiek. UPDATE: Všetci toto čítajte, lebo ja si strašne prajem, aby na Slovensku vyšla celá séria. وروايات الغسق لاستيفاني ماير عن مصاصو الدماء، وانك ستعيش أجواءاً دافئة بين أوراق رواية تبدو من عنوانها غاية في الخيال اللذيذ! وستتنقل بين الأزمان في قوالب ممتعة من الرواية، وكنت أخطط الى أي مقهى سأجلس فيه لـ ابدأ قراءتها وسط اندماج تام..
الرواية كانت جامدة، لا تشويق فيها، وهي عبارة عن احداث عادية، فلان ذهب للعام ١٩٩٤ وجلس في الحانة، والتقى بفلان وعاد مجدداً للعام ٢٠١٠. لم استطع تجاوز المائة صفحة منها بسبب التكرار الممل للأحداث، وان السر الذي يتمتع في اخفاءه الروائيون عادة حتى نهاية الرواية قد فضح على غلاف الرواية بوجود منظمة سرية، وان هذه المنظمة السرية ستجد لها ذكر طبيعي دون الشعور بالخطر الحقيقي للاشخاص حين التعرض لها في ثنايا الاحداث. عدت الى برنامج القود ريدز لاراجع رأي القلة الذين وضعوا لها نجمة واحدة، فوجدت ان مائتين قارئ يحملون الشعور الذي شعرته، بل واضافوا بان رواية رواد الزمن موجهه لفئة عمرية (المراهقين)، لكن مهما يكن حتى وان كانت للمراهقين، فان التوليفة الفنية المشوقة افتقرت لها هذه الرواية..
"Let's take a episode from the TV series Time Tunnel and write it in print"
What do three random strangers have in common? Well imagine this, your having a normal day and then you are told by a complete stranger your about to die. You have a choice, either stay and face death or be pulled out from the situation you find yourself in and become a member of the Timeriders. Or is that Time Tunnel? To me, this does read like a lazy rip-off from the old TV series. There is even a episode similar to thi "Let's take a episode from the TV series Time Tunnel and write it in print"
What do three random strangers have in common? Well imagine this, your having a normal day and then you are told by a complete stranger your about to die. You have a choice, either stay and face death or be pulled out from the situation you find yourself in and become a member of the Timeriders. Or is that Time Tunnel? To me, this does read like a lazy rip-off from the old TV series. There is even a episode similar to this novel. OK sarcasm and rant aside, for a YA book (that being basically Parental Guidance in reading) it's not too bad. I certainly have read young adult novels in the past and have found they don't always fit the stereotypical demographic of said genre - this is a good thing. Now you know how the book starts. Liam O'Connor is a deck hand on the sinking Titanic. Maddy is about to be blown to bits in a aeroplane accident and little Sal is about to choke on a lollypop (or something like that - oh it's a subway accident, silly me). They all take Mr. Foster up on his offer for a chance to escape their doom, shortly afterwards (well within ten pages) they are fully-fledged members and appointed 'Timerider', awesome. Well no not really, I found it completely implausible. Not the time machine part, more a guy from 1912 (Liam) is able to grasp the situation and changes so quickly. This could just be me, which is fine, it's all subjective. Why do we need Timeriders? Well by the year 2024 a theoretical paper is produced wherein the practical application of time travel is made possible. By 2057 a time machine is made and a individual passes through into a different time. The professor returns, swearing to destroy his machine and all his work, due to what he saw. This was a bluff, and sometime in the later future the machine is discovered by Paul Kramer and Karl Haas, along with his tooting-rooting-killing-machines, OK marines. These guys are the antagonists, even though Mr Paul Kramer is just too nice for my liking. By this point (2066) the world is dying and no longer able to sustain life. Kramer decides to use the machine to go back in time and essentially change the future, wherein he finds himself at the Wolf's Liar aka Wolfsschanze. You might be able to guess where Alex Scarrow is going with this particular plot line - "schnell schnell man amerikanische idioten" or words to that affect. The writing style is a little different for me, Chapters flow with a maximum of three-five pages, which makes this a very fast read. Prose is fairly basic in my opinion, the story-telling by Alex Scarrow is given to us straight out of the box - this for me, negates any future character development further on. Essentially none of the characters do evolve other than Bob, a cyborg who has a learning computer for a brain (hopefully not from the Early Learning Centre though!!). Which is kind of ironic. I have a few other criticisms of the book; If I have to hear what a "smart lad" Liam is one more time, I might have to visit the writer. What is it with Liam's Irish accent? None of them miss anyone from their old life! Why wouldn't a agency such as this be prepared for changes in their own timeline. Such things as fuel and internal power might help. Food and water also. This part just felt too convenient. Now I feel like a dirty slutter for saying this, I actually wanted to read more, but know I shouldn't. I'm going to give book two ago. This one has dinosaurs in it apparently *shudders*. Unf. I really wanted to like this book more than I did. Time Riders has a simple but brilliant concept: time police. Whenever anyone goes back and tries to change the timeline, they dash in, guns a-blazing and fix it, along with the help of Bob, a sort of android-y being whose unemotional attitude leads to some occasionally hilarious oneliners. The main characters, (aside from aforementioned android) are Liam, a boy who should have died on the Titanic in 1912, Maddy Carter, who should have died i Unf. I really wanted to like this book more than I did. Time Riders has a simple but brilliant concept: time police. Whenever anyone goes back and tries to change the timeline, they dash in, guns a-blazing and fix it, along with the help of Bob, a sort of android-y being whose unemotional attitude leads to some occasionally hilarious oneliners. The main characters, (aside from aforementioned android) are Liam, a boy who should have died on the Titanic in 1912, Maddy Carter, who should have died in a plane crash in 2010, and Sal Vikram, meant to have died in a fire in 2026. Instead, they became Time Riders. So, the concept is great, and the story itself is pretty good- although I will stress, it gets very dark at times. There's a great deal of death, graphically described, and some really cringey moments of destruction and horror. Without spoilers, one character gets treated to an absolutely nightmarish end (although time travel rectifies this). The problem? Scarrow seems to think big, but his actual writing was... well, I don't know. To me, it felt amateurish. He tends to tell rather than show, and occasional moments of descriptive prose feel forced and unnatural. Some writers err on the flowery side of writing, some on the plainer, and I think Scarrow's happiest without heavy description. There were also some truly astounding puffs of unlogic that annoyed me. For instance: it's explicitly mentioned, and referred to a couple of times, that Liam has a fear of water and can't swim. Yes. So he willingly joined the crew of the Titanic, did he? That one really stood out to me, although there were others, and occasionally there were small historical slip-ups that irritated me too. For instance, Hitler's mentioned to have come to power in 1932- it was '33, and I don't think it would take more than a Google search to find this out. This particular error can't be blamed on them changing the time-line; or at least there's no such explanation given. Otherwise, a couple of minor overly contrived bits of good luck for the protagonists pulled the story through for a happy ending, but I didn't mind this too much; it just barely made sense, and otherwise, the book would have had a seriously depressing ending. Having just read the second of this series I believe it is time I retrace my steps and quickly review this fine novel. Of course if you want a more interesting read jump on to the second review. As far as YA reads go TimeRiders is brilliant. There's a lot of action, a lot of deaths and lots of technology. Not to mention that a few brilliant twists and tension exist in spade-loads throughout the gripping plot. Of the two I have read there is no doubt the first is superior in terms of plot and wow Having just read the second of this series I believe it is time I retrace my steps and quickly review this fine novel. Of course if you want a more interesting read jump on to the second review. Of the two I have read there is no doubt the first is superior in terms of plot and wow factor. Alex Scarrow writes well with intelligence and creativity, not stooping to point out obvious facts through his characters. Rather each character tends to respond as a reader, an every-day man or woman thrust into the circumstances they face, would. Time travel. If the whole complexity of the idea doesn't intrigue you then I don't know what will. Liam, Maddie and Sal are all plucked from various times in history by a man known simply as Foster. Each of them should and would have died on the Titanic, on a plane or in a fire. Saving them from such disasters, where no bodies would remain, allows for no time contamination as you may have already guessed. What I did find interesting is that their base is set on September 10 and 11 2001 in New York. They basically have to live in a time loop that keeps them witnessing the terror of the Twin Tower explosions over and over again. In this instance however the author uses the incident as a backdrop, a setting rather than using it to depict the horrors consistently. Which I appreciate as a reader. Ou Kriste, tak toto teda skoncilo! Perfektna kniha, perfektny napad, perfektne premyslene. Zo zaciatku sa mi to ale nepacilo, prvych 100 - 150 stran mi pripadalo chaotickych, otvorim knihu a hned Titanic, potom pad lietadla, potom rok 2026, potom Kennedy, potom 2066, potom Hitler, potom dvojicky... a ja ze hello, mam statnicu z historie, ale ledva sa v tom orientujem takto, vela a naraz, ale potom som pochopil, ujo nam to musel vysvetlit a zaroven rozvijat pribeh, inak by sme knihu odvrhli, ze p Ou Kriste, tak toto teda skoncilo! Perfektna kniha, perfektny napad, perfektne premyslene. Klady: Cestovanie v case je vskutku narocne, nieze len zavriem oci a letim a potom ma zrazu nieco vtihane spat, nie, treba vela energie, spustu dohadovania, a nie len ti zli menia cas, ale aj ti dobri, tym ze sa niekde zjavia, nieco spravia zmenia cas. Alternativnu historiu ma ujo perfektne premyslenu, a samozrejme mame radi Boba! P.S. : poslednych 25% som precital asi za hodinu, ako sialeny v autobuse, hltal som to kazde slovo, mozno len druhe, lebo som potreboval vediet ako to dopadne! P.S.2: mozno moj nazor na knihu nie je vcelku objektivny, lebo som stretol autora!!! a je totalne sibnuty!!! I loved the concept of this book, and some of the character development was good. The action scenes are excellent. The only swearing used, over and over again, is Jesus' name, which bugged me. I know not everyone shares my faith, but sometimes, in instances like this, I feel like I'm having someone throw their disbelief in my face over and over again. I'm not a fan of swearing in books generally, and this kind of ruined the book for me. I can't recommend it to friends, even th I loved the concept of this book, and some of the character development was good. The action scenes are excellent. The only swearing used, over and over again, is Jesus' name, which bugged me. I know not everyone shares my faith, but sometimes, in instances like this, I feel like I'm having someone throw their disbelief in my face over and over again. I'm not a fan of swearing in books generally, and this kind of ruined the book for me. I can't recommend it to friends, even though there were parts of the plot and character development that I loved. Pierwszy tom serii Time Riders to fantazyjna podróż do przeszłości. Wartka akcja, wyraziści bohaterowie, humor, wszystko ciekawe i dopięte na ostatni guzik. Scarrow bardzo pozytywnie mnie zaskoczył i pokazał, że każdy może w jakiś sposób odcisnąć piętno w historii. Jeźdźcy w czasie spodobają się nie tylko fanom podróży w czasie, ale też miłośnikom historii i osobom, które chcą przeżyć niesamowitą przygodę z barwnymi bohaterami w roli dowódców. Gorąco polecam! Awesome read! Hard to put down. Can't wait to read the next book in the series. Fortunately there will be NINE books!!!!! Liam měl zemřít v podpalubí Titaniku, když se potopil. Maddy měla zemřít v letadle po té, co vybuchla bomba. Sal měla uhořet v Indii. Liam je z roku 1912, Maddy z roku 2010 a Sal z roku 2026. Všem třem byla nabídnuta možnost žít, ale už nikdy se nebudou moci vrátit do svých životů tak, jak je znali. Místo toho začnou pracovat pro agenturu Jezdců v čase. V budoucnosti totiž lidé sestrojí stroj času a lidé se tak budou moci vrátit do minulosti. A právě proto jsou tady Jezdci času. Mají zabránit a Liam měl zemřít v podpalubí Titaniku, když se potopil. Maddy měla zemřít v letadle po té, co vybuchla bomba. Sal měla uhořet v Indii. Liam je z roku 1912, Maddy z roku 2010 a Sal z roku 2026. Všem třem byla nabídnuta možnost žít, ale už nikdy se nebudou moci vrátit do svých životů tak, jak je znali. Místo toho začnou pracovat pro agenturu Jezdců v čase. V budoucnosti totiž lidé sestrojí stroj času a lidé se tak budou moci vrátit do minulosti. A právě proto jsou tady Jezdci času. Mají zabránit a napravit změny minulosti, které měly fatální důsledek a změnily tak budoucnost. Mám moc ráda knihy o cestování v čase a alternativní realitách, změnách času a tak vůbec. Fascinuje mě to, protože bych se sama ráda do minulosti nebo budoucnosti podívala. Jen tak na skok a pak zase zpátky. Knihou jsem byla velmi příjemně překvapena. Příběh byl opravdu dobře napsaný, nevadilo mi skákání z minulosti do přítomnosti, pak do budoucnosti a zase na přeskáčku. Nebylo to rušivé a síš mě to víc navnadilo na čtení, protože jsem byla zvědavá, jak se celá situace vyvine. Postavy byly výborné. Oblíbila jsem si všechny tři hlavní hrdiny, Boba i Fostera, jejich "učitele". Veškeré popisy cestování v čase, důsledků, povinností, byly srozumitelné, nebyly zbytečně zamotané, šlo o logiku. A to se mi moc líbí. This is an enjoyable first book in a neat time traveling young adult series. Time Riders is an easy read that will have you flying through the pages. The cast is a bunch of young likables that we simply need to know more about. The premise is cool...a secret agency plucks our heroes out of time moments before their deaths. They are all chosen for their unique talents and gifts, wether that is being the analytical one, the technical one, or the one that can formulate tactics and plans. The story quickly unfolds and Liam and Bob quickly become the focus and the center of this story. I like how it all came together and can easily see how this will be a fun series to read. Aihhh bukunya keren, sangat menghibur, menegangkan dari awal sampai akhir. My favorite character is Bob. Saya harap dia bakal muncul lagi di buku buku selanjutnya. I'm not going to finish this book! It really wasn't that bad but I'm just really not interested in reading more of this and it's been on my currently reading pile for over a month, so I don't feel too bad. And YES, I'm shelving this as 'read' since I read it more than halfway through and could have spent my time reading other books instead! I'm not sure if it should be a 1* or 2* for me. Let's say 2, for the Terminator shout-outs, which made me smile (I watched T1 and T2 when I was in middle school, and I still have fond memories of those), for the couple of good things I liked, and because I didn't actually want to throw the book through the window. In fact, I think it could be nice for a younger audience—maybe 7th graders—because if you don't pay attention to the plot holes, well, the story has the potential to be a fast, entertaining read (though a bit frightening and gruesome in parts for the really young readers out there). The characters weren't particularly well-developed, but neither were they insufferable, and I appreciated the plot not being bogged down by the useless romance I see rearing its head in too many YA novels. However, the plot holes are what sunk this book for me. It's dealing with time travel, a very, very tricky subject, and one that is really not so easy to master. As soon as it enters the game, it brings its lot of questions: what's the science behind it, what about paradox, what happens if a character meets him/herself from the past, and so on. Unfortunately, TimeRiders didn't deal well with that in my eyes. Here's an example: the characters live in a sort of "bubble", from which they observe the same two days in time. Within the bubble, they age normally, but every couple of days, the world around them is reset, and reverts back to what it was at the beginning of their observation period. One of the characters' role is to stay outside, keeping an eye for whatever may be different, a sure sign that a shift has occured somewhere in history, and report it to the others so that the team's analyst can locate the problem, and the actual timr-travellers can go there to fix it. However, there's no explanation as to why this character isn't affected by huge time shifts. (view spoiler)[At some point, the whole world is destroyed, so her parents can't have been born to give birth to her later, so why does she still exist? (hide spoiler)] That kind of problem is never really addressed nor explained. I would've been content with something as simple as "once you're plucked out of time, you can't be affected by shifts anymore for [insert whatever reason]", but I don't even remember seeing that. This review has been hidden because it contains spoilers. To view it, click here. This book had me debating between three and four stars, I loved the concept - it is a very me book - science fiction travelling back in time. And I loved the concept of TimeRiders patrolling the past making sure that history is not rewritten. Now I felt this book was very good - exciting, tense and thrilling, but then sometimes it seemed to drag a little, not that it was bad specifically, but it sort of dipped in content, it became a bit stagnant or peaked and then dipped a little. I can't put m This book had me debating between three and four stars, I loved the concept - it is a very me book - science fiction travelling back in time. And I loved the concept of TimeRiders patrolling the past making sure that history is not rewritten. Now I felt this book was very good - exciting, tense and thrilling, but then sometimes it seemed to drag a little, not that it was bad specifically, but it sort of dipped in content, it became a bit stagnant or peaked and then dipped a little. I can't put my finger on it specifically but I felt sometimes it lacked its spark that had me excited throughout. The book was introduced very well, the introduction of the three main characters who are chosen to become TimeRiders - Foster saving them moments before they die...very cool. I liked the story - Second World War changing; Kramer (the wrong doer in the book) wanting to make the future world better by taking back technologically advanced weapons and trained mercinaries to help the Germans win the Second World War - preventing the world in the future becoming desolate and weak (in the year 2066 where Kramer originates from New York City is like a ghost town - the country has been damaged severely by depression and famine etc due to the economic crash etc.) And he, along with 24 other people want to prevent that from happening and they think that helping Hitler to win the war - and then taking over from him - will make the world a better place. So when the three TimeRiders are first introduced to their job - training exercises - it is interrupted with an actual shift changing the world they are in - 2001 New York - to a country that looks more like a regimented controlled state. The tree TimeRiders - Liam O'Connor, Sal Vikram and Maddy Carter and Mentor - Foster, not forgetting the support unit Bob are thrown into the thick of it as they are charged with putting history back to its original state. This book had such promise... but then screwed it up by "dumbing down" to be understood by YA readers. Unfortunately, they forgot that young adults are actually capable of understanding things like: paradoxes and literary inconsistencies. The worst of it is that there is a "time bubble", within which the time travelers are safe from the looping of the same few days and the effects of changes in the timeline... EXCEPT for the one girl who is standing outside "when" the timeline got changed by a bu This book had such promise... but then screwed it up by "dumbing down" to be understood by YA readers. Unfortunately, they forgot that young adults are actually capable of understanding things like: paradoxes and literary inconsistencies. The worst of it is that there is a "time bubble", within which the time travelers are safe from the looping of the same few days and the effects of changes in the timeline... EXCEPT for the one girl who is standing outside "when" the timeline got changed by a bunch of military types traveling to WWII. So, wait - some people in the future travel to the past and change it, so that someone stuck repeating September 10th and 11th sees changes happen all of a sudden?!? Why, oh why, do writers of YA literature continue to get away with not thinking through all that they are writing about, simply because "it's for teens, and teens don't think too deeply, so we can get away with writing crap and getting paid for it."? I think that if I allowed my children to read this, they would be insulted that I would think this is a good book for them to read. As someone who reads and reads and reads i have always said i'm not going to get sucked into the kids / YA market. EG Harry Bloomin potter market, its a kids book for kids and can be read by kids. BUT....i have been proved a liar. Im a huge fan of Alex Scarrows writing so when i heard about this book i had to give it a go, the concept alone is brilliant, but as usual his main strength comes to the fore. Great characters. The man just knows people and writes them so well and that comes across so we As someone who reads and reads and reads i have always said i'm not going to get sucked into the kids / YA market. EG Harry Bloomin potter market, its a kids book for kids and can be read by kids. Im a huge fan of Alex Scarrows writing so when i heard about this book i had to give it a go, the concept alone is brilliant, but as usual his main strength comes to the fore. Great characters. The man just knows people and writes them so well and that comes across so well in this book. Time slip is his normal forte, and this time he takes it one step further and is even able to move in time, this series has so much potential i wish i had kids to share it with...but there are always nephews, nieces and god children, and lets face it im hooked as well. im not going to hide this book on my shelf, it can sit proudly next to the grown up books. So in Summary no matter your age...go buy this book i promise you will not regret it. Alex Keep up the great work...lets see loads more of these Timeriders...and great news for any fans to go with this is Alex also has Afterlight due out this year, so all fans get Double Alex Scarrow fun this year. Wow, what a brilliant book. So exciting all the way through. Really couldn't put it down at all. Became totally intrigued with the story concept and all of the characters. Looking forward to reading the next book. A good concept that keeps the pages turning in the latter half of the book but drags a little at the beginning. If I'm being really picky I'd say that the author could have shed about 100 pages. Just needed to be a bit bolder with the red pen. Action-packed, but plot could have been tighter and pace a little faster. Since signing up as an author with Orion, I seem to spend most of my time hunched over my laptop in various cafes and coffee bars sipping lattes, tapping keys and watching the ebb and flow of shoppers outside on the street. As I write this, I'm awaiting the launch of my next book - the sequel to , LAST LIGHT, and getting ready to find a publisher for the first book in a separate series, ELLIE QUIN. Ahead of me, lies research work for my next thriller, and also some screenplays I'm looking forward to writing. Although I'm glad to be where I am now, I do occasionally kick myself for not having succumbed to the writing bug much earlier. But then we all just muddle along through life, don't we? There's rarely a plan.